Mega Millions on Friday coupled with Powerball jackpot of Wednesday which is $345 million would be more than a whopping billion dollars! 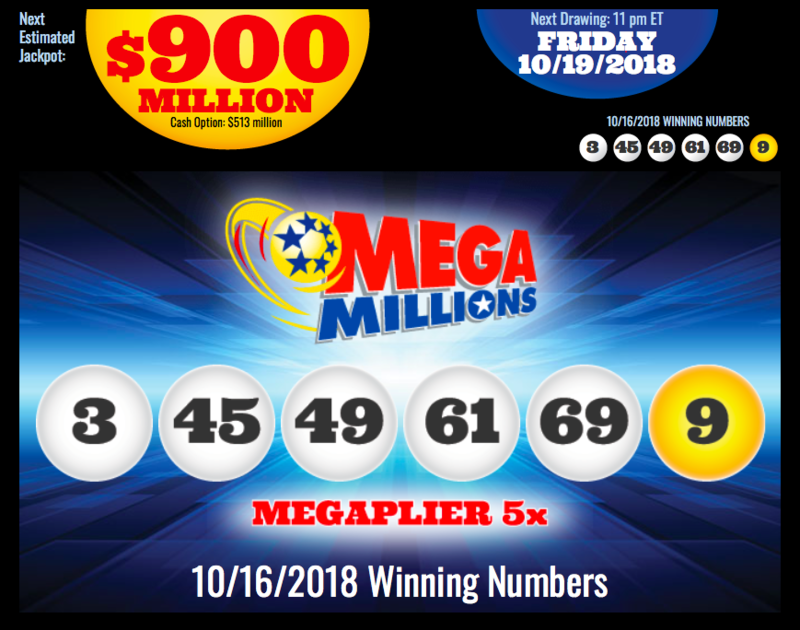 Tuesday’s draw were 69, 45, 61, 3, 49, while, the Mega Ball number being 9. Photo taken by Mega Millions. Ok…So, Mega Millions didn’t get a winner in Tuesday’s lottery draw. So, that means Friday’s draw value jumps to $868million or the lump sum cash equals $494.5 million. This makes it the biggest jackpot in history of games and 2nd biggest in the lottery jackpot of US so far! On Tuesday night, Mega Millions jackpot broke its own record as yet again none of the tickets had all the 6 matching numbers. The numbers of Tuesday’s draw were 69, 45, 61, 3, 49, while, the Mega Ball number being 9. Mega Millions on Friday coupled with Powerball jackpot of Wednesday which is $345 million would be more than a whopping billion dollars! The primary reason why these jackpots have bloated to over a billion dollar is simply because there has been no winners off late. The winners of the last Mega Millions were 11 co-workers who won $543million.Talking about the Powerball jackpot, it was won by an individual from Staten Island, New York. While $1.2billion is obviously a massive amount, yet is it not the biggest prize in the history of lottery. The biggest prize so far has been won in 2016, where Powerball Jackpot winner won $1.586 billion, which was jointly shared by 3 winners. So, eventually, each winner got a lot less than a billion dollar. Also, one needs to take annuities, taxes and the fine print in to account to ascertain the actual amount won. While we may not see a jackpot winner soon, one must understand that rather than focusing solely on the jackpot, the focus should be on the other prizes, which are well worth few millions. Very few of you may know that much of these amount go unclaimed because most people want to vie for the jackpot. Shruti is a professor at Noida University. She has done her masters in E-commerce and Finance sector. She is now planning for her doctorate in the same field. She is specialized in Business, E-commerce, Finance, and Marketing niches.